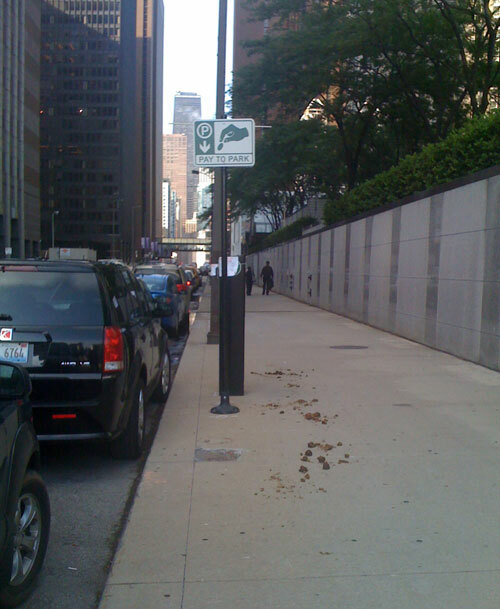 Is this a metaphor for what Rahm thinks of the parking meter deal? So Chicago taxpayers owe more money on the parking meter deal? $50 million to be exact. I&apos;m happy that the city is fighting the bill, but the irony is delicious. Will the mayor have to contest this bill like I contest a parking ticket? Does Rahm hope the police officer doesn&apos;t show up to court so the ticket gets thrown away? Did they take pictures of how close the city&apos;s tire was to the yellow zone? I would love to see the mayor go down to the parking ticket office and wait in line and then get a rude customer service representative that is two minutes away from her shift ending. That would be sweet. I was in Old Town last night (cause that&apos;s how I roll) and I found a metered spot on North Avenue in front of Pipers Alley. I punched the "max" button to get the full two hours needed and I was met with a $3.50 an hour charge. To park in a metered space for a little over two hours was going to cost me $8.50. That&apos;s not the Chicago I know and love. That&apos;s an imposter. Wait, a designer imposter. B story: Police Superidentent General Garry McCarthy was in studio yesterday explaining what was going through his head during the skirmish with NATO protesters at 22nd and Michigan. It was fascinating to listen to his recollection of the moments that most of Chicago watched live. The interview was like a DVD commentary. Which would be an awesome regular segment. Hmmm, I&apos;m on to something. C story: Gambling passed the house! Heereee! Heereee! The Illinois house passed a bill that would allow for casinos in Chicago. This is different than the last time the house passed a gambling bill because there are no slot machines set aside for O&apos;Hare. This is no different than the last time the house passed a gambling bill because it&apos;s not going to get past Governor Quinn. So this is a lot of efficient work by our legislature. Bravo. D story: Columbia College is thhnking of changing their admissions policy from "anyone with cash" to "some with cash." That will change things for that college. You know how much money the college makes off of letting unqualified students drop big cash to realize they aren&apos;t college material? That&apos;s a goldmine. E story: Today on Afternoon Shift, we got Tavis Smiley in studio. That, plus a discussion about small-market sports. Does Chicago do enough to take advantage of being a major-market sports town? I say no. Every stadium we have in town is either undersized or falling apart. But let&apos;s see what our experts say. Sports: It&apos;s been a while since I&apos;ve done a blog like this, but my main focus on sports is to get you up to speed on the storylines in Chicago sports so you don&apos;t seem like such a loser at dinner parties. So here goes: The Chicago White Sox are players this year. Unexpected, yes. But right now, the Sox are .500 and 3.5 games back from the Cleveland Indians. Jake Peavy (Sox pitcher) is one of the top pitchers in baseball. Konerko leads the AL in hitting. Adam Dunn is back and the Sox just aquired Orlando Hudson, who is a huge upgrade at 3B for struggling Brent Morel. And Sale is one of the best young pitchers in the game. Back to Peavy...this is a big deal because he used to be that and the Sox traded for him and then he became, like, the 400th best pitcher in baseball. Fantasy baseball has him ranked #2 overall after the first two months of the season. That was a bit unexpected. North Side? No. South Side? Maybe.